The Lava Trees in Lava Tree State Park were created in a 1790 lava flow. The flow entered the area and buried the 'Ōhi'a Trees up to 11 ft deep in molten lava. Trees that were surrounded by the molten lava cooled the lava that coated them, while the heat of the lava caused the tree to burn to ash. When nearby fissures opened and allowed the molten lava to drain away the slightly cooler lava that surrounded the trees were already starting to harden and remained above ground. Lava Tree State Park consists of 17.1 acres of native plants, trees and many lava tree molds - most of which are still standing. A small paved trail takes the visitor around the park and is easy walking for adults and children. The park has bathrooms and three covered areas for picnics, including a barbeque pit, but no drinking water. 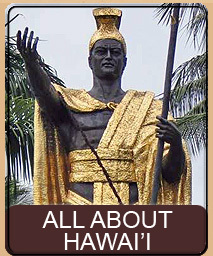 The Lava Tree State Park is in the lower Puna district. To get to the park take Highway 130 towards the town of Pāhoa. Pass the first intersection that takes you into Pāhoa and at the next intersection (the intersection with a traffic light) make a left onto Pāhoa-Kapoho Road (this is also Highway 132). Follow this road for about 3 miles until you see the park on your left. The park has a paved parking lot and restrooms accessible from the parking lot. There is no drinking water at the park. The trail around the park is paved but is uneven and broken in places due to tree roots. The trail is not navigable through its entire length by wheelchair. Also, heed the signs that warn you to stay on the trail. There are many dangerous, deep fissures, many hidden by vegetation. 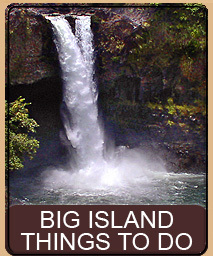 The Lava Tree State Park is at about 500 ft above sea level. 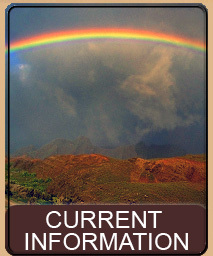 Since it is on the East side of the Big Island the weather may be wet though warm. Shorts and rubber slippers or shoes are adequate. You might want to have light rain gear in the car in cast it decides to rain. 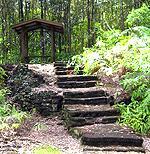 The Lava Tree State Park sits within the Nanawale Forest Reserve in the lower Puna district near the town of Pāhoa. 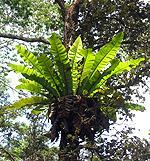 While lava trees can be found in several locations on the Big Island this particular park has several excellent example as well as being very accessible. Another (even better but less accessible) example of lava trees can be found in the Hawai'i Volcanoes National Park. Lava trees are made when molten lava coats trees in one of two ways. First, a fissure can open that sprays fountains of lava into the air. The falling lava coats trees and burns the insides out leaving a lava mold around the tree. The second way for lava trees to form is molten lava flow filling an area and then draining - leaving the rock trees behind. 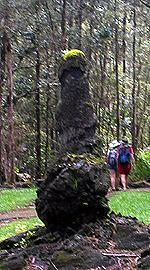 The Lava Tree State Park is an example of this second method of formation. 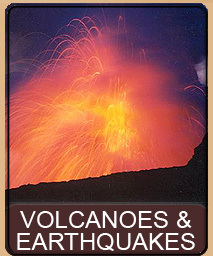 In 1790 the East Rift of the Kilauea volcano opened up and issued a huge pahoehoe lava flow. This lava flow entered a wet 'Ōhi'a Tree forest and filled it to a depth of over 11 ft in molten lava. When the liquid lava, at 2000° F, came in contact with the cool wet trees the lava touching the trees began to cool. At the same time, the tremendous heat consumed the tree leaving a perfect mold where the tree once grew. 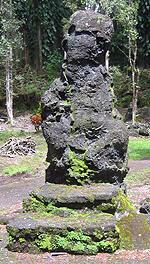 The mold is so perfect that you can still see the imprint of the bark in the lava rock itself. Soon after filling the area with lava a nearby fissure opened in the ground allowing all the lava in the area to drain back into the earth. Because the lava surrounding the trees had already cooled due to the temperature of the trees, the lava molds did not drain but remained as monuments to the trees that once stood in the same spot. 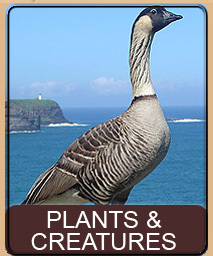 The park is an excellent way to see both native Hawaiian plants as well as the fascinating Lava Trees themselves. The park has three structures offering protection from rain as well as picnic benches and even a rock grill for cooking. Bathrooms are at the park entrance but there is no water available. This page is named 'Parks.ltree'. Can't Find It?